The biggest travel trade fair of the world, ITB 2016 has been officially inaugurated today, 9th March 2016 at the Maldivian stand. The honors of the ribbon cutting at the Maldives’ stand were performed by the Minister of Tourism Honorable Mr.Moosa Zameer and Secretary General of UNWTO Mr.Taleb Rifai. This year, the exhibition celebrates its 50th anniversary and Maldives is the official partner country of the fair. 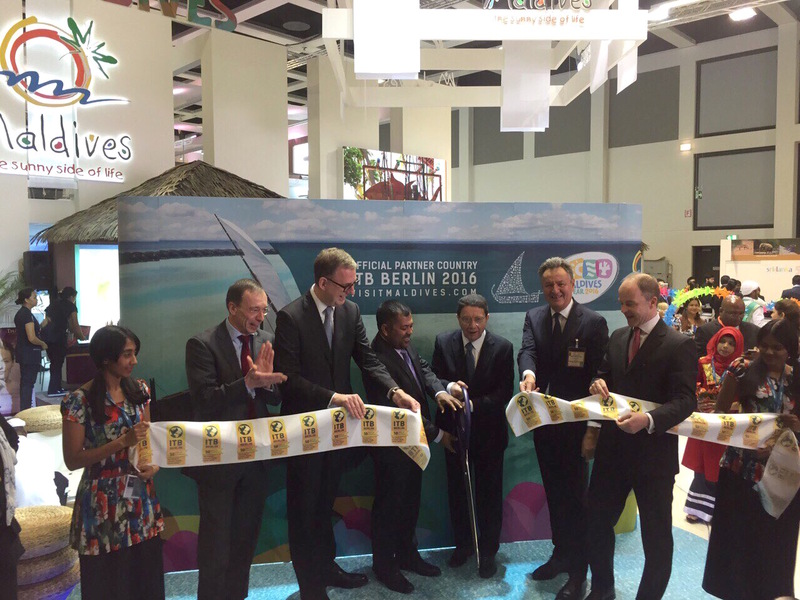 At the inaugural ceremony, the ribbon cutting at Maldives stand was the first activity in the running order, which was followed by ITB Convention at the Berlin City Cube. To rejoice and appreciate the Maldivian tourism industry and its prominence to the country, Maldives will be hosting a special evening dedicated to the industry stakeholders, trade partners and exhibiting companies at Berlin tonight. This special event “Maldivian Night” is one of the most favorite activities of the tourism industry and will be attended by more than 600 individuals. Hosted at the Wasserwerk, Hohenzollerndamm, a historic dining lounging hall in Bundesallee, Berlin. A number of industry invitees, trade partners, media representatives and government representatives from Maldives will be attending this special Maldivian Evening. To start off the evening with, the invitees will be welcomed with special drinks after the registration at the entrance, which will be accompanied by live and calm band music. After seating the guests, the Minister of Tourism HE Moosa Zameer will address a welcome note and a promotional video of the destination will be released. Maldivian performances will then take place, for the guests to enjoy before the buffet dinner. Cultural performances and ‘Boduberu’ will accompany the guests during dinner. After a raffle draw amongst the guests and awarding special prizes to the winners, the Maldivian Evening will then be concluded with live DJ.